I've been moving all day so I am just now settling in my new place (10pm!). Anyway, the market did not turn down as I was expecting and the market managed not only to break above the 1321 resistance but the Trend Average as well. So the next level I am looking at is 1333. If the market breaks that, I'll expect the market to challenge the 1343 high so I will probably play it safe and cover shorts at 1334 to re-short again later. But as I said last week, the catalyst for a big sell off are in the market and it's just a matter of time. For one, there are planned protests in Saudi Arabia on March 11th so it'll be interesting to see how the market will handle it. I wouldn't be surprised if it's "news" when it happens, just like Lybia was "unexpected news" last week. The market reached the 1316 target I mentioned yesterday and found resistance at the 1321 level, which is the 50% retrace of the 5 waves down. 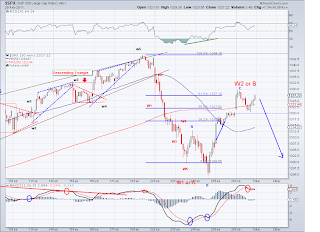 And I think this W2 or B wave is now complete (it could go as high as 1343 of course before getting invalidated) and the next wave will give us an idea of whether this is a correction within the larger uptrend or the end of the uptrend. 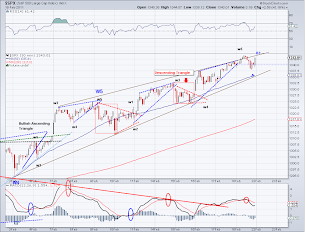 If this is a C wave, the market will find bottom around 1280. 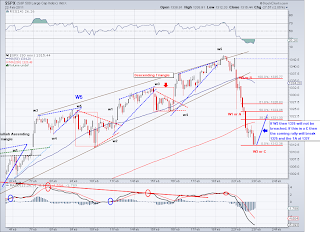 However, if this is a W3 wave, I'd expect it to end up near the 1227 support level when all 5 waves are done. It is obviously too early too tell but as long as the market does not close above the Trend Average or establish any uptrend channels outside the downtrend, there is a good chance we are witnessing a correction of a higher degree. Last week I pointed out chaos in the Middle East as a catalyst for a sell of early this week and I was right on it. Today, this risk has essentially escalated so the excuse for a much larger correction is right in front of us. And it's interesting when I see headlines claiming things are not that bad given we're only down 2% from the highs or that the "worst is over", etc. Obviously, these people don't understand how waves develop. The first sell off is never the one that puts people in panic, it is the one after the counter rally that does. I re-shorted my position covered at 1316 on Tuesday at 1317 today. 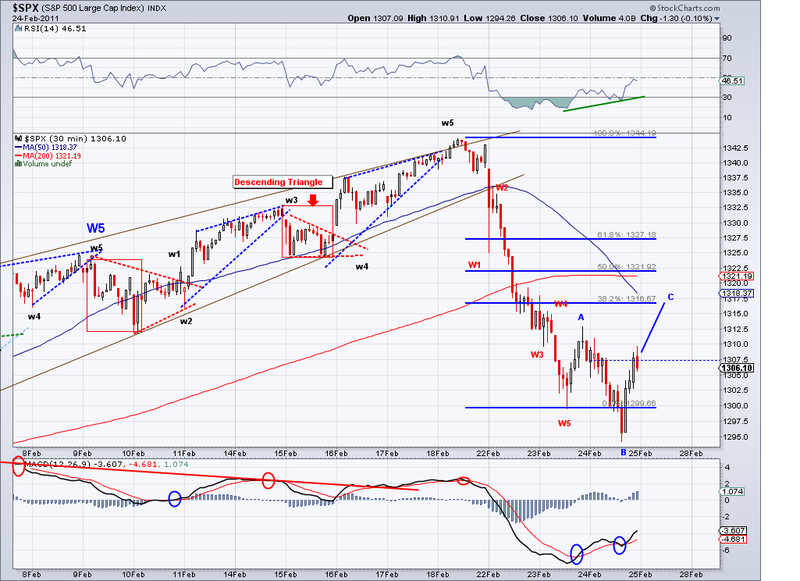 The market seems to be working its way to the Fib retracement area from the bearish impulse wave from 1343. 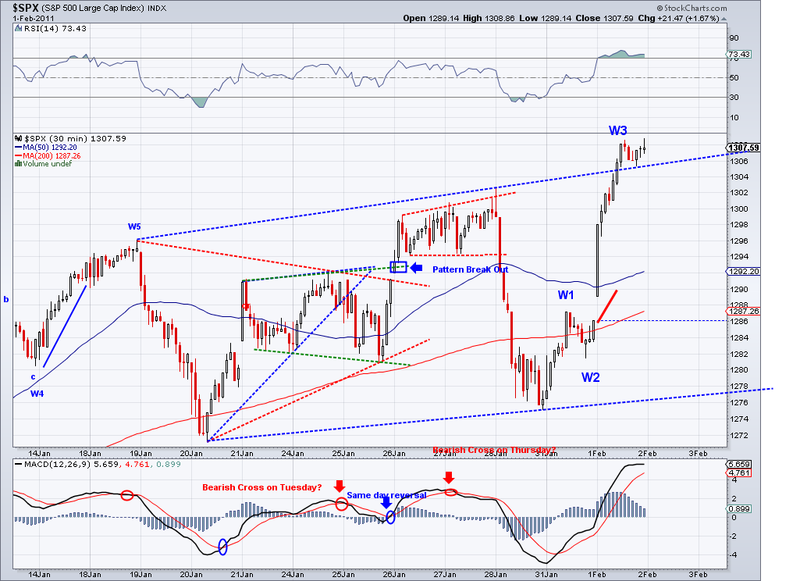 And I would label today's move as an Expanded Flat with the market currently in the C wave. 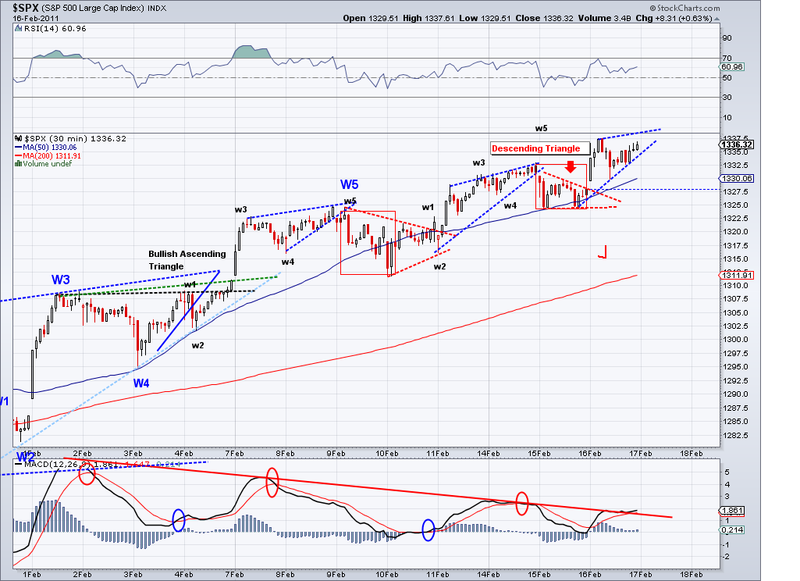 So I am expecting this wave to reach 1316 before resuming another bearish wave. The short term trend is clearly bearish now and until it is reversed, the next target is the 1280 support level. 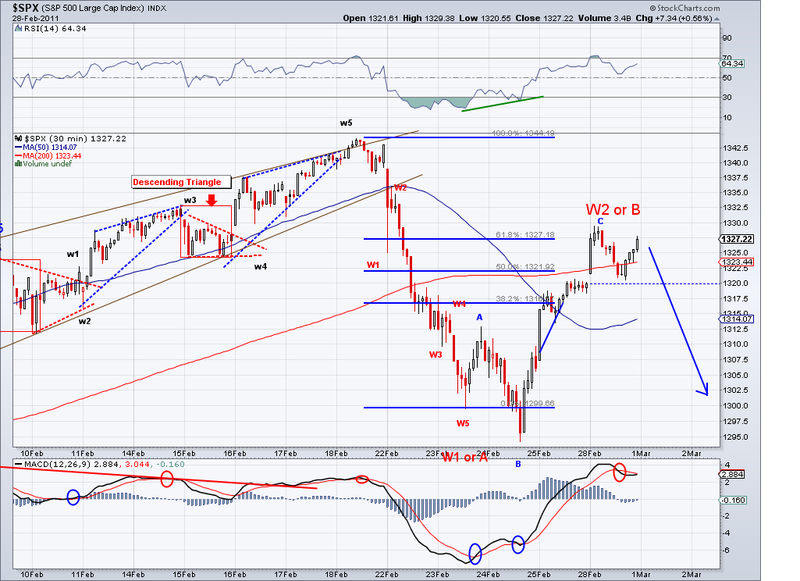 The market ended up retracing overnight in the e-minis for a W4 and what we got today was the W5 to 1299. 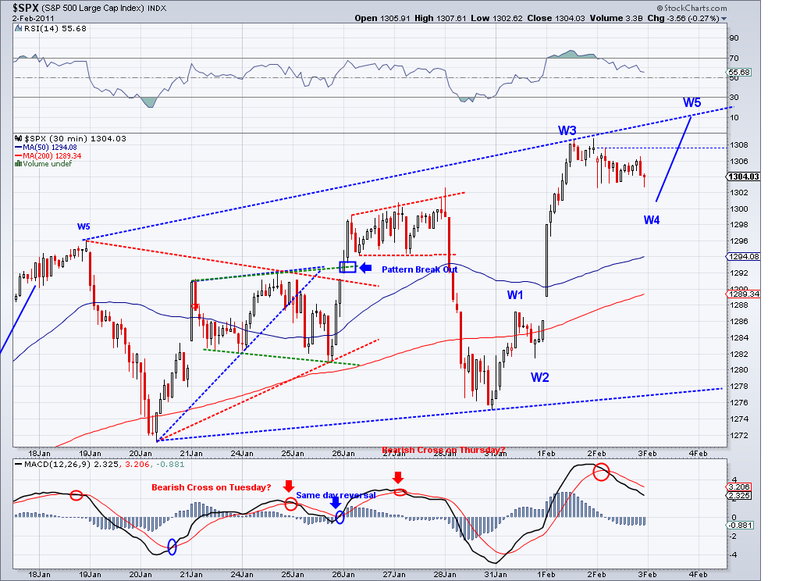 And I see the bounce so far as a counter rally in a B wave or a W2. If this is a B then we'll probably see a "Flat" or basically reach near the 1343 high. 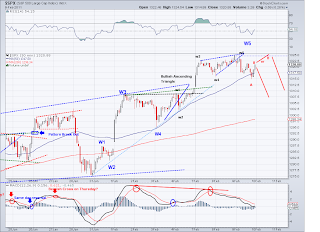 But if we are not getting an ABC move then the next wave down will be a strong sell off in a W3 to perhaps the 1250-1260 area. I am looking to enter short positions and sell longs on this bounce. The market did go into correction on Friday as I had suspected but this time we are getting a correction of a higher degree. The labels I had on Friday ended up being a W1/W2 with W3-W5 completing in the E-mini market. 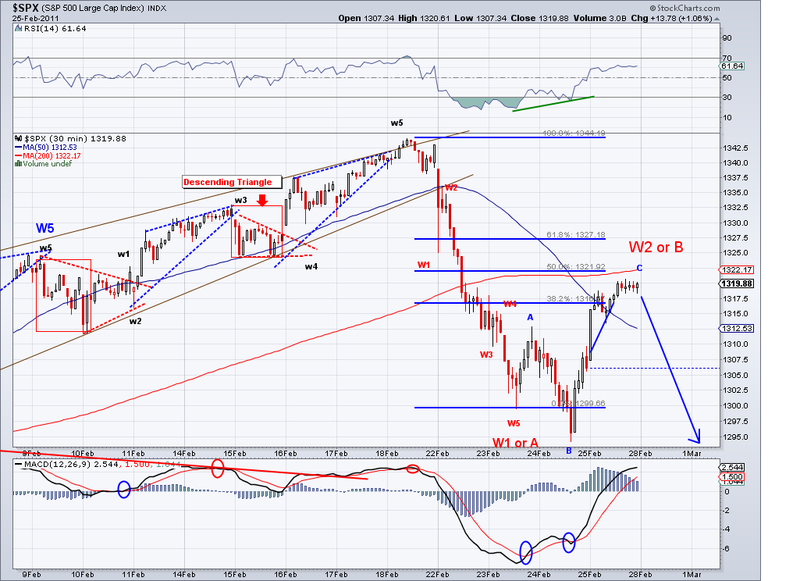 The market started today in bouncing mode and I think the bounce is either a W2 or a B. 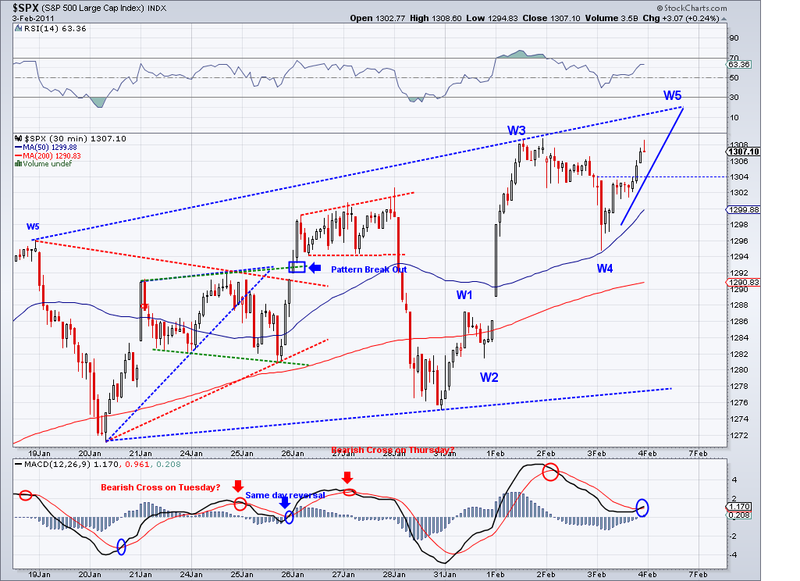 The question now is finding out what is the wave from 1335 to 1312. Considering W1 or A was 22 points, this current wave is about the same at 23 points so this could well be just a correction within the bullish trend. However, if we get a bounce that does not break 1325 tomorrow then it will be a W4 and we'll be on our way to 1304. 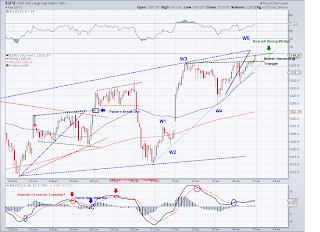 The weekly trend is now down and the market would have to break 1343 to turn it back up. I covered my shorts from last week at 1316 and re-shorting at the coming bounce. The cash market is closed today but the E-minis are down substantially, currently challenging the trend average in a W3. 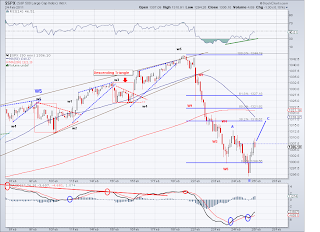 As I speculated on Friday, if the trend does not hold then the possibilities of a intermediate top and a correction of a higher degree might be in the works. Libya is now the reason for the sell off, if turmoil spreads to Saudi Arabia you can bet there will be $100 plus oil and a plunge in the stock market. Also, on a side note, Gold is flashing a buy signal so I will initiate positions in Gold. It seems the biggest bullish wave in Gold is the one coming. 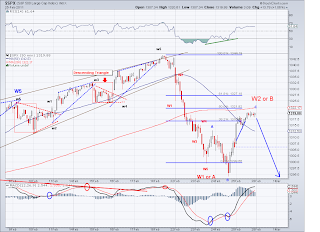 The market shot up the rising wedge and quickly reversed and it looks like an end of the Rising Wedge and the market going into an ABC move or a W1/W2 wave. However, it is hard to say what the market wants to do at this point so we should should see what Tuesday brings. There is a bearish cross on the MACD and the Middle East seems to be descending into chaos, so bears might just get a big down day on Tuesday. However, if the trend average (currently at 1331) holds, then we're on to 1350 for sure. I am keeping both my long and short positions over the weekend but I am leaning bearish due to the extreme optimism right now. The RSI and MACD are ridiculously overbought, last time it reached these levels was (today's readings are actually higher) in December 2007, few months before the top of the market. But this time there is no bearish divergence on these readings so this rally will probably continue after a healthy correction. We reached 1340 after a few days of trying and so far we've had one rising wedge after another in low volume. And by looking at the chart, the one today should be over tomorrow. What I am watching out for is how this next correction will behave. 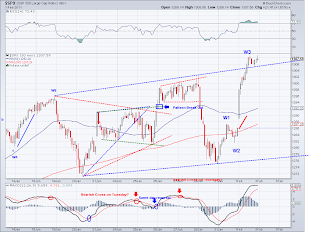 I drew the uptrend channel which coincides with the trend average which is about 1330, so I expect the correction to test these levels tomorrow or Monday. If these support levels hold, we'll be on our way to 1350 and meet the target for February. I am holding shorts but ready to cover if support hold and continue to hold on to my longs. The market broke out of the Descending Triangle and reached its bullish target with the gap up. 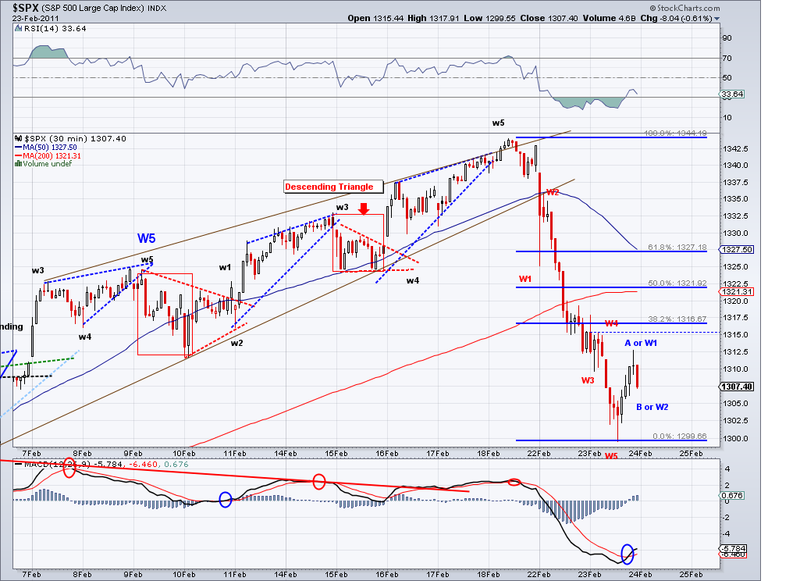 Today's gap was impulsive and clearly bullish and there might be more limited upside to come on this leg. The question everyone many are asking is how much longer can this go on. Every single correction since August 2010 have been minor ones and at some point there will be more sellers than buyers. Elliott Wave counts are about to be exhausted as well as there can only be so many waves. The market is very overbought on the daily RSI (over 70) as well as the weekly RSI (over 70). In addition, the market has pushed out of the bullish range on the monthly Bollinger Bands so conditions are ripe for a strong correction. 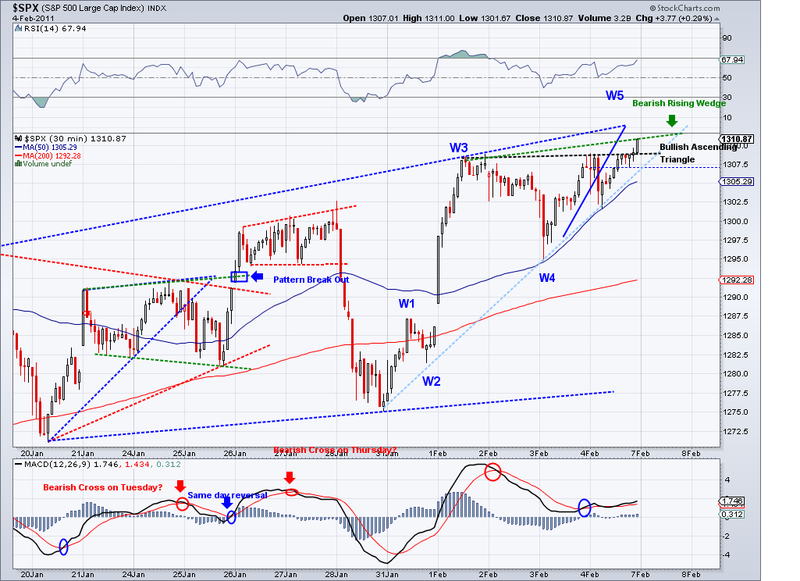 But as long as prices continue above the trend, the target for Feb (1350) might just be around the corner. I covered at break even today at 1332 and shorted again at 1335, I think the market might put in another Rising Wedge so we'll see what the next correction brings. The trend average is now at 1325 so we should see a test again tomorrow or Friday. The market started the correction today as expected. However, the trend average has not been tested and there is a Descending Triangle in place. Normally, I would label a Descending Triangle under the trendline as bearish. However, since this is taking place above the trend, the market might just be correcting enough to launch for another 5 waves to new highs again. So tomorrow we should get a better idea of what the market wants to do. I raised my stops on my shorts taken yesterday to break even just in case the we are on our way to 1340 and will cover at a profit if there is a bullish break out of the triangle during trading hours. We got the higher high today as expected but the market opened in a W4 so I think the higher high came in today in a W5 so this might be it for this particular leg. Ideally, the leg should have come closer to 1340 but the pattern is looking like a Rising Wedge (just like the one from last week) and there was a roll over on the MACD. 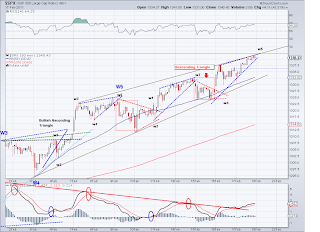 If tomorrow we get a down day, it will confirm a bearish divergence between the MACD and the market which builds the case for a correction of a higher degree coming very soon. I went ahead and got back 100% of the shorts I covered at 1316 last week at 1332 towards the end of the day. So we'll see if the coming correction is another test of the rising trend or a real corrective sell off for the wave that started in late November (or August for that matter). So we got the consolidation and we rallied like I predicted yesterday. Not to brag about my market speculations but I have been right every single day for the last week so the system I've been fine tuning for the last few months is working well. I don't expect to be as accurate all the time but as long as I am accurate at least 51% of the time, I'll be ahead of the market. Anyway, the correction that started earlier this week ended up being a "lesser" degree correction so I think we are on a new 5 wave count on our way to 1340-1350. I expect the current wave to continue so we'll probably gap up when the market opens and then go into a W4. 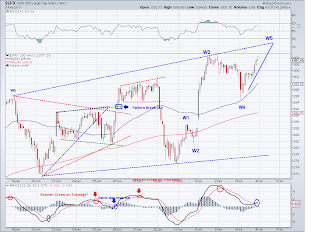 If not then we should open with a W4 and then push above 1330. Once we get there, it will be really interesting to see if the correction that we get is the major correction a lot of traders have been looking for. Technically, there will be no better time to put in an actual top for the rally from 1040. But I don't want to call a rally top because it is of no use (and dangerous for shorts) trying to do so. I covered my shorts taken earlier this week at a minor loss at 1316 right before the triagle break out (my cost avg was 1313) so it was not that big of a deal but I still should have covered yesterday at a profit if I had only woken up on time. I will be buying the same covered shorts on Monday or Tuesday after all the 5 waves complete and see if "the" correction finally comes but I am still holding on to my longs. The market put in another leg down today and tested the rising trend average (1310) as I mentioned on yesterday's post but I decided to change the labels as I think there will be another test of the trend tomorrow. So I think these waves will triangulate or put in a leg down to the 1305-1310 area before launching yet again to the 1350 area. My goal was to cover at the trend today at a small profit but unfortunately I was asleep.. I am in the West Coast and I was up till 3am so by the time the markets opened at 6:30am PST, I was deep asleep so I missed out on some profit. I guess I should buy a loud alarm clock so this stuff never happens again. 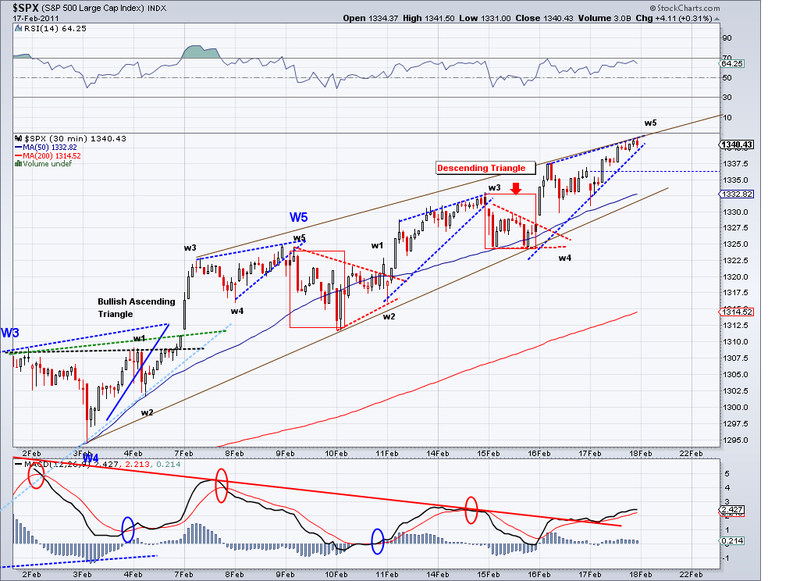 But anyway, bottom line is the rising trend is intact so I am assuming higher prices after this correction is done. 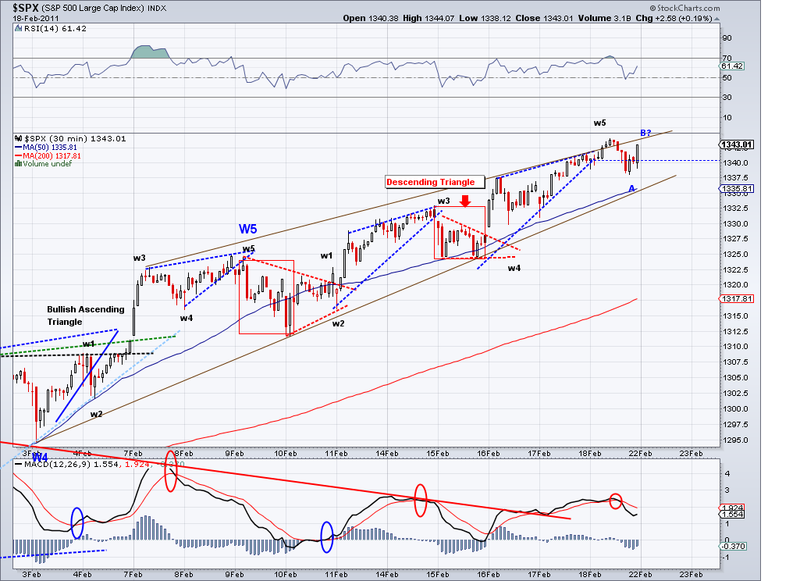 The correction started today as I speculated yesterday and so far it does not look impulsive. So I am assuming we will have a "Zig Zag" to a proper Fibonacci retracement (perhaps the rising trend average) and then put in another bullish 5 waves. I labeled the low today as an "A" and we're currently working on a "B" leg which probably ended today or will end tomorrow/Thursday before another leg down. 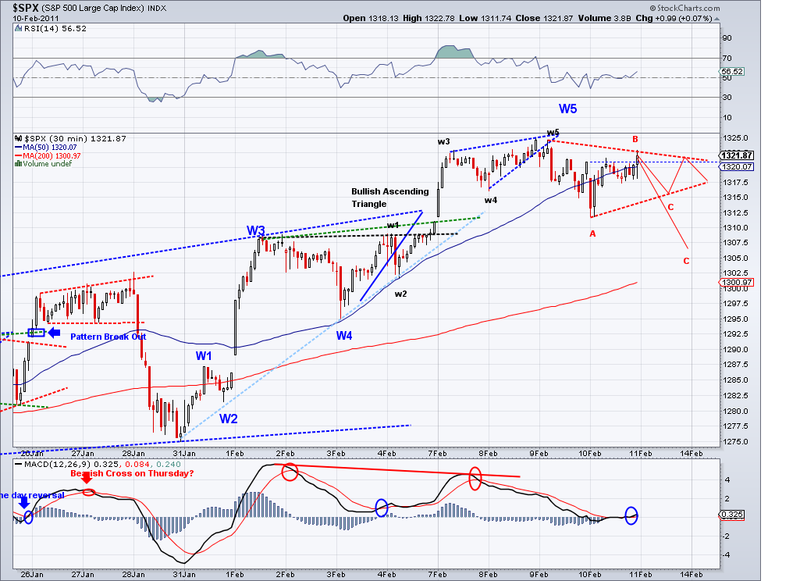 If that leg down after the B is a major sell off then I'll label it as a W3 as there will be follow thru selling. In the meantime, I am keeping longs intact and holding on to my shorts to cover at the "C" leg. On a side note, Gold seems to be either back testing it's bearish trend line but if it holds, then there will be a 13/34 cross over and it will be a good bullish trade as inflation is set to appear later this year and gold will be used as an hedge. The bullish wave from its August low has retraced to the expected Fib level so it will probably launch on a big Wave 3 to much higher highs. I expect the stock market to parallel Gold's waves, so we'll probably see a similar correction to the 1180-1215 area on the S&P (assuming there is a top at 1325, which is inconclusive at this point) and then launch again. 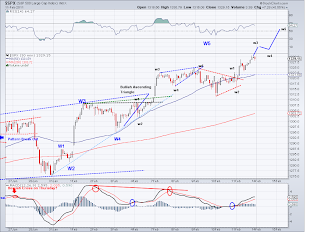 Wave 5 of the pattern seems to be over or about to complete tomorrow morning. 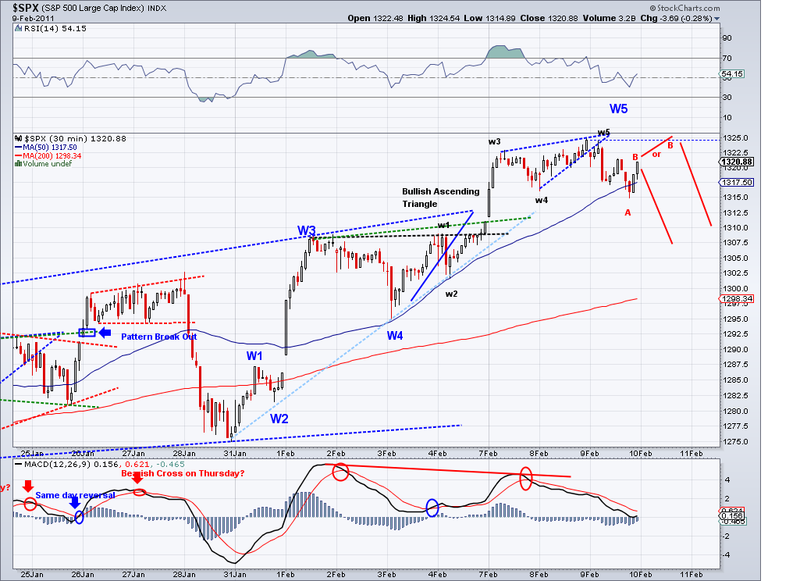 So we should see a correction starting tomorrow if we follow Elliott Wave rules. I think everyone will be watching this correction since talk about a deep correction is all over the place now. Volume is very light and this usually indicative of a topping process BUT like I've said before, as long as these corrections pullback just enough to test the trend average, the rally will continue regardless of how overbought the market is. Once the pullback comes, I think the market will set itself up for the strongest rally yet since the March 2009 low. 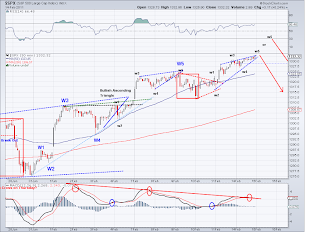 The pattern I was betting on was broken by the gap today by what I see as a W3 of a W5. So we either topped on this leg today or we are still working on the W4 of this W5. So I went ahead and shorted the remaining 25% at 1320 and will just wait for the correction to see what we get. 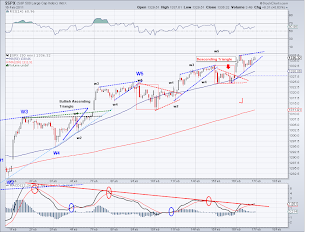 If we get a zig zag correction to the 1310 area then we will see a launch of yet another W5 to possibly 1330. But if we get an impulsive down day to test the trend average (currently at 1301) then it will be a correction of a higher degree (like an "A" or a bearish "W1"). I will cover on anything less than impulsive as this market just wants to keep going up and up. Right now bears want a pullback to cover and bulls want a pullback to buy at prices, so it's hard to see who keeps on buying. This period reminds me of the month in 2000 when the NASDAQ went from 4000 to 5000 in one month, people were going crazy buying and chasing the market and there were talks about DOW 35000 by 2010 (Remember "The roaring 2000's by Harry Dent", who btw recently switched to predicting DOW 4000). 10 years later and we've basically gone down/nowhere. Blind optimism has a price. 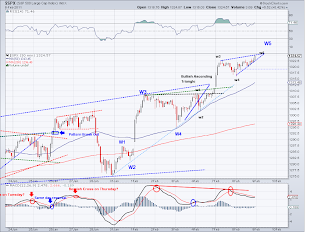 Bearish Rising Wedge or Ascending Triangle? The market got to the 1310 target I mentioned yesterday but at the same time there was a lower high that completed part of Bullish Ascending Triangle pattern. 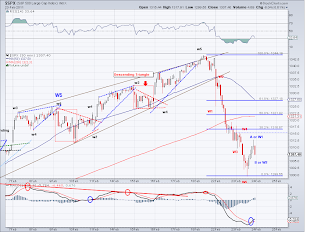 However, given the fact that this rally is overly extended and this is a Wave 5, I am inclined to think this is a Bearish Rising Wedge with a coming correction on Monday or Tuesday. So I went ahead and re-shorted 75% (I give the BRW a 75%) of my usual short position at 1310 to cover at the test of the rising trend or at a Fib retracement. Is hard to say how much longer this rally will go but if Elliott Wave Theory is correct, all the bullish waves are about to be exhausted and no further upside will be possible without a meaningful correction. On a side note, I saw this article on CNBC which mentioned a target for 1775. 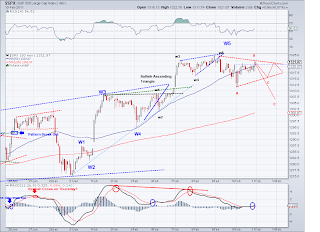 This target would fit the "bullish P3" count I posted. And given the fact the Feds and the President use the stock market to instill confidence in their policies, I am sure the government will do whatever is necessary (as in printing enough money) to make sure we end up with an all time high for the S&P 500 by the time election time comes around. Then Obama can point to the success of his policies by telling us the market is way up. Is the Fed's Real Target 1,755 for the S&P? The index retraced a bit more this morning to test the trend at 1295 and turned up as expected after the initial pullback. 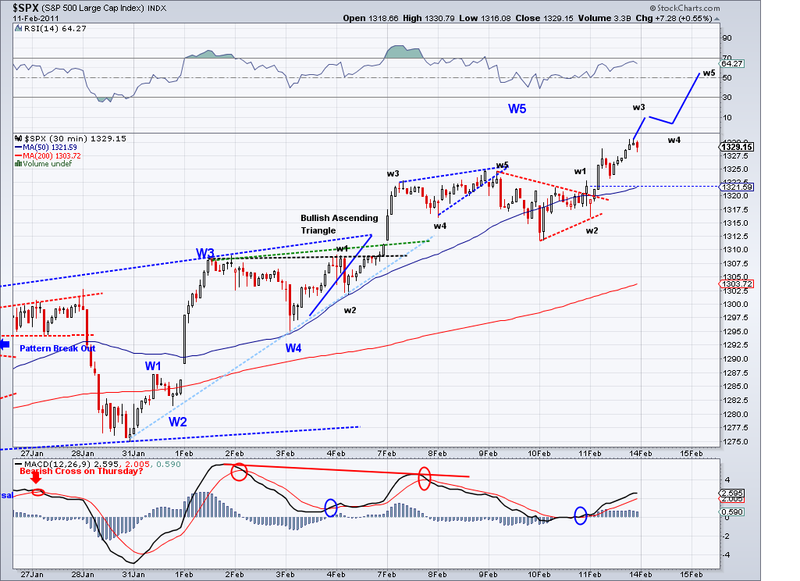 The pattern looks like a normal 5 wave move so I assume we will see Wave 5 top in the 1310+ area (maybe 1315?) and then correct yet again. 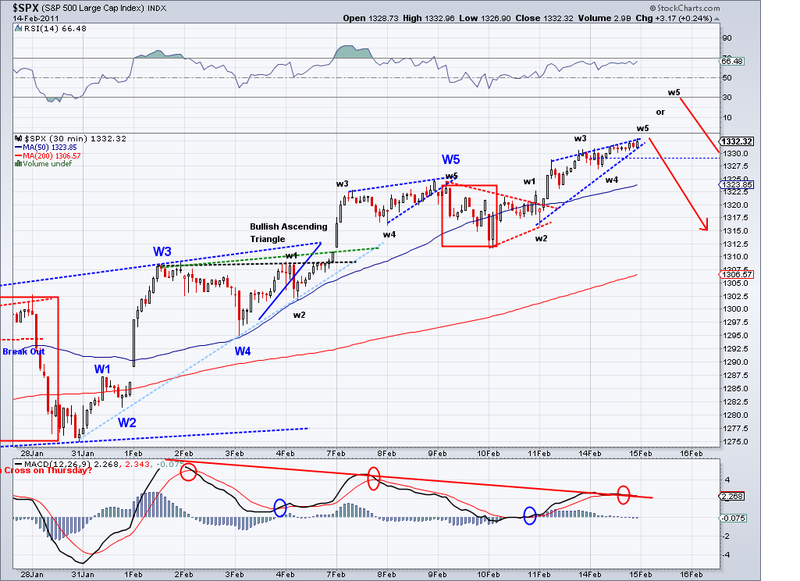 Question of course will this be a W2 correction of a higher degree or "the" correction. I think I've been fairly accurate in pointing out the corrections, the challenge has been figuring out the correct degree of correction. 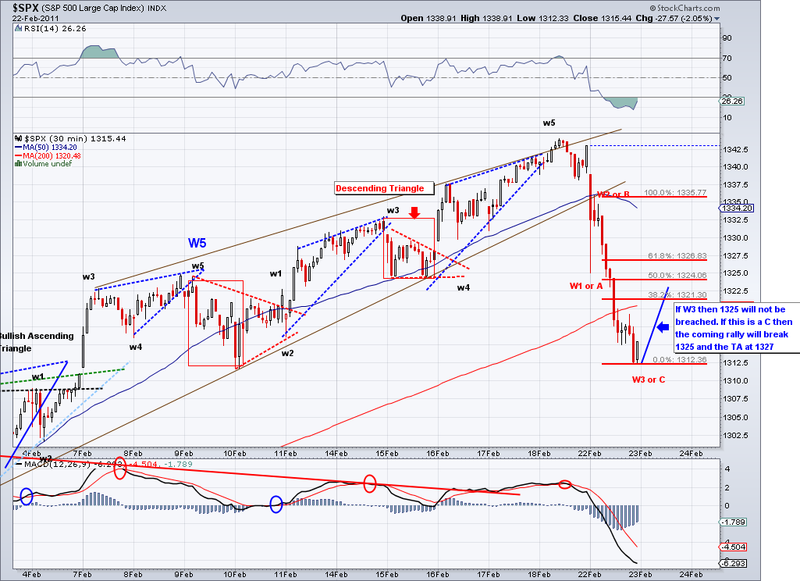 So if the next correction is a W2 then we'll see 1350 in a few weeks. 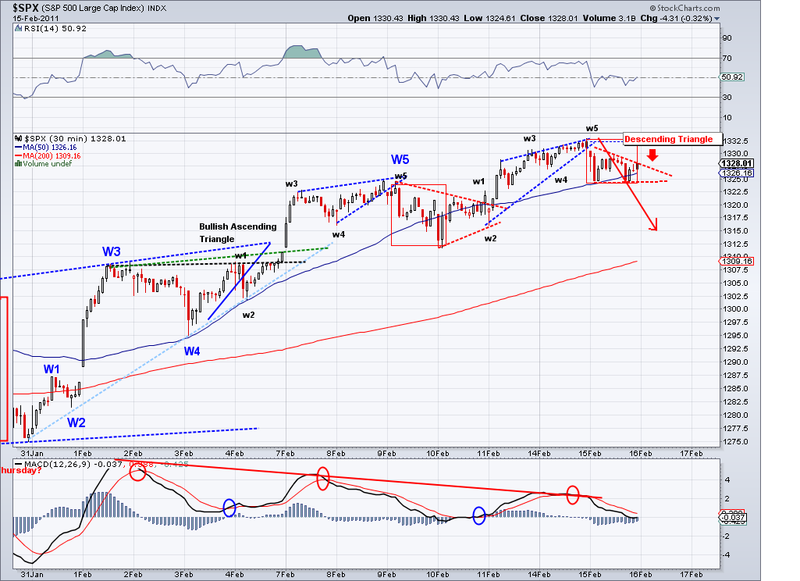 Or if this is "the" correction then we're going down to 1230. I used the pullback today to cover the remainder of my shorts at 1296 for a small profit (the ones taken at 1299) and will re-short the entire position at the end of W5 tomorrow if it comes. And btw I forgot to add that there is a possibility of an Ascending Triangle, which means a higher low tomorrow before breaking out of the AT formation. If there is an AT formation then the target is going to around 1330. 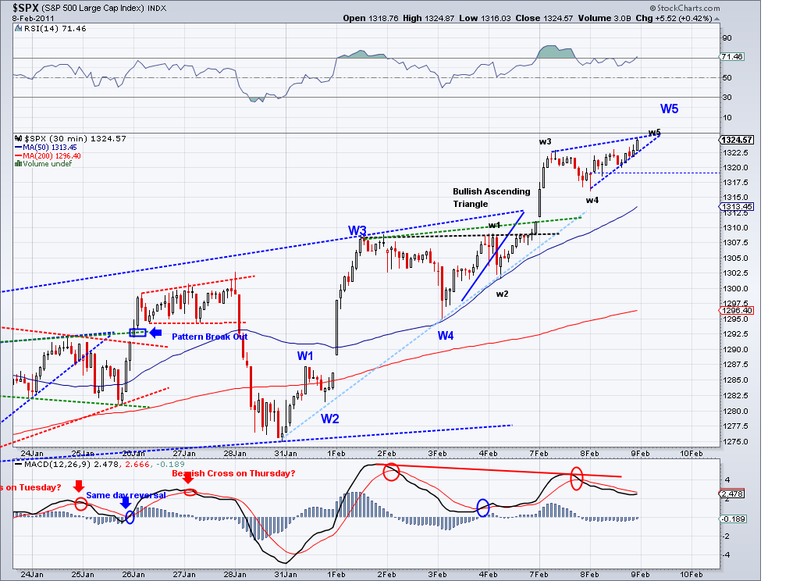 Basically, the longer in consolidates the higher it will go. 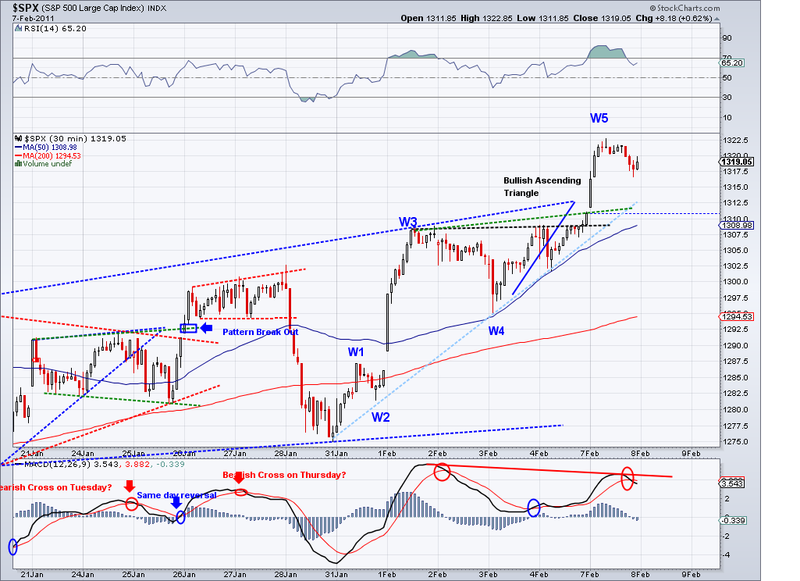 So for trading purposes, it will be better for the index to go higher tomorrow so we can start correcting right away. 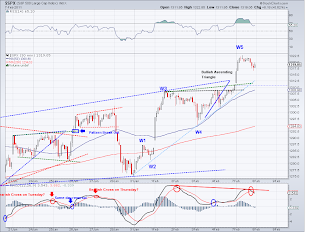 The market seems to be digesting the gains from yesterday and it does look like a typical Wave 4. So it will probably correct a bit more and then launch or start going tomorrow morning. The catalyst (or should I say the excuse) for the sell off last week is still in the background and apparently deteriorating, so the market has a good excuse to sell off anytime. Looking at Bollinger Bands, it looks like we'll have an impulsive move in the next couple of sessions. I am also updating my targets for the month today. Looking at wave structures and trendlines, I think we will see 1350 if the market persists above the trend average or break down and start correcting to the 1230 area. So I am projecting 1350 or 1230 by the end of this month. So far, it seems like the intermediate count I posted 6 months ago is the one we are currently on. And if this is correct, we will see 1500+ by year end. So if you are a short without stops (a horrible strategy promoted by you know who), keep this count in mind as it can save you a lot of money. So much for Egypt being the catalyst for a correction. The market reversed all the negatives from the sell off last Friday by closing well above the trendline (and in turn failing to confirm the downtrend) and turning the weekly trend back up by putting in a higher high. Therefore, the most probable scenario is further upside. 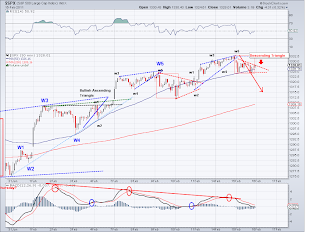 From looking at the current wave, it looks like there is still a W5 before a correction for this particular wave. I pared down shorts today but did not cover them all. And I am still keeping my longs from December. My goal was to start selling long positions at the first sign of a bearish trend confirmation but this rally just seems to keep going and going.